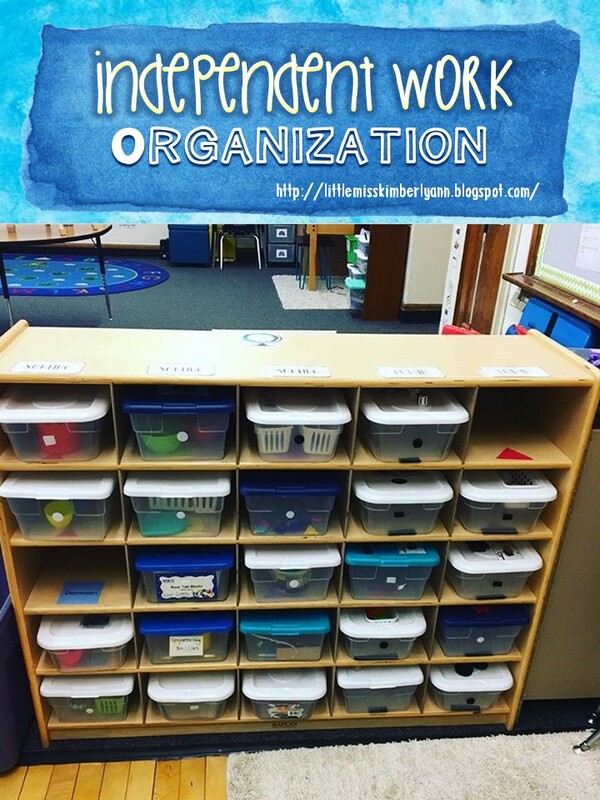 Organization in special ed classrooms can be tricky! 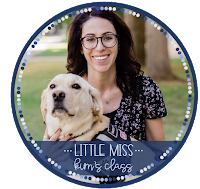 If you're like me and have a lot of adults in your classroom (we have 5-7 staff in the classroom depending on the day! 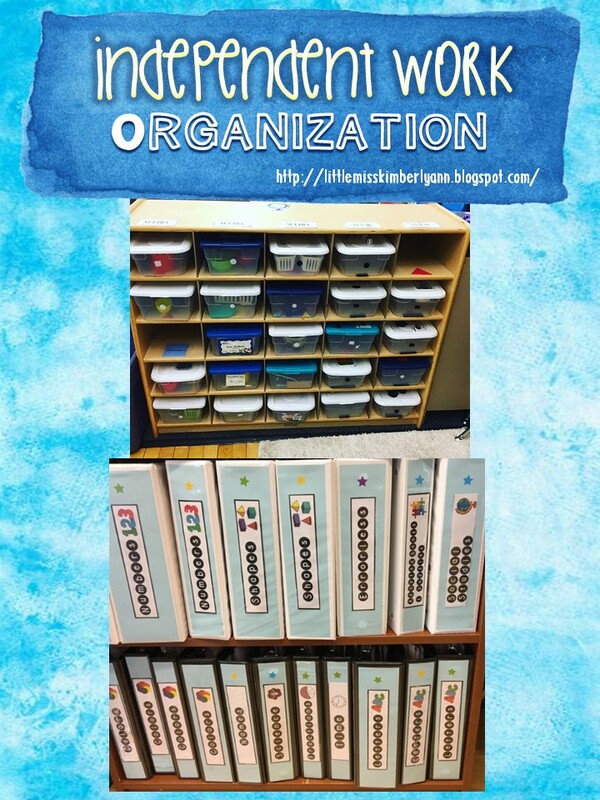 ), then organization is even more important! You're busy enough and can't spend any extra time looking for supplies/ materials or trying to explain to someone where materials are in the classroom. I've changed how I organize my independent work SO many times the last few years because I was struggling to find a system that worked for me and my staff. 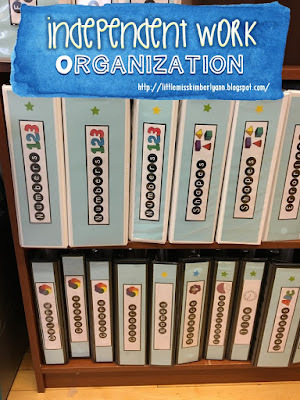 I think I'm finally happy with our organization system and don't think I'll be changing it much anytime soon! I keep put in/ sorting work bins in this bookshelf with cubbies. 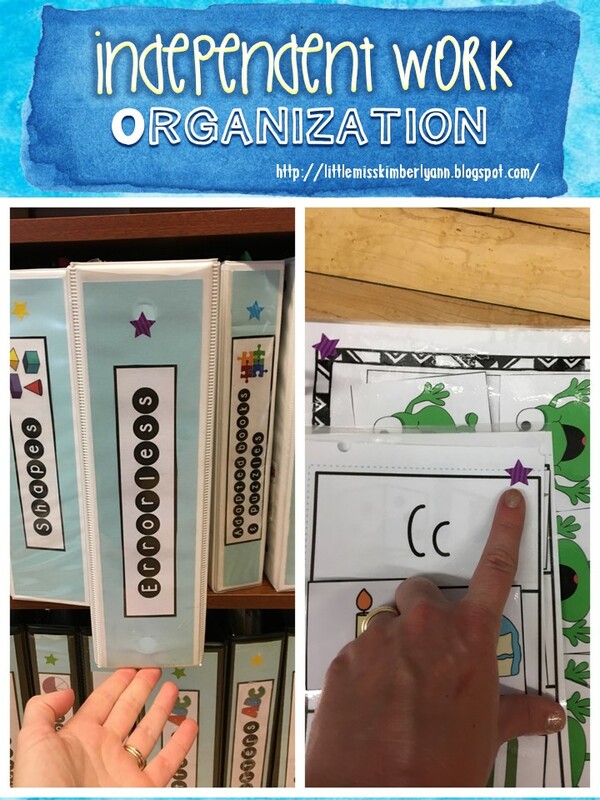 We have them organized in rows based on if they're put in or sorting tasks (It's hard to see, but there are labels glued on the top of the bookshelf that say "sorting" and "put-in"). I also have more boxes put away in a cabinet that we rotate out every 2 weeks. 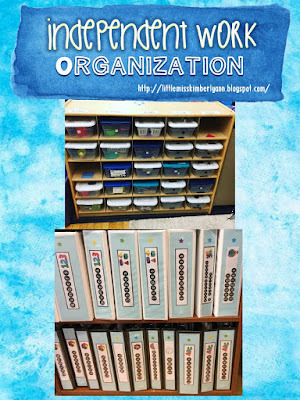 Our paper tasks are neatly organized in binders. First, I separate tasks based on topic (colors, counting, letters, shapes, science, social studies, time, etc.). After I have tasks sorted by topic, I then separate the tasks based on levels. 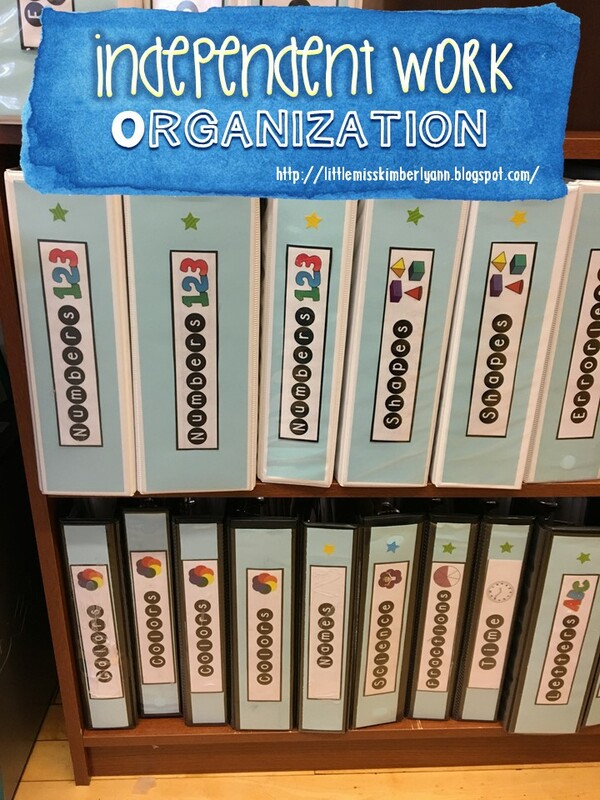 I put the tasks separated by topics AND levels into separate binders. Next, I bought a TON of colored stickers from the Dollar Tree and assigned a color to each level. 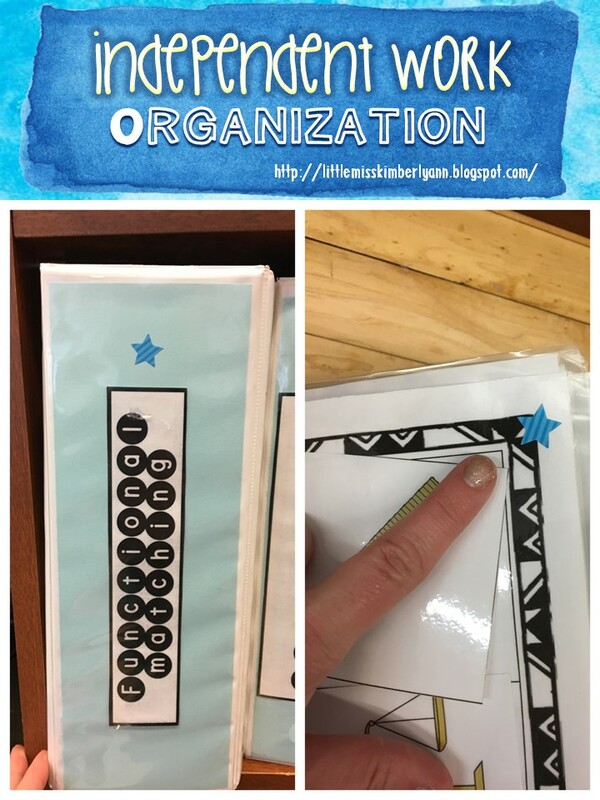 Then I put the corresponding sticker on the binders and on each page/task in the binder. 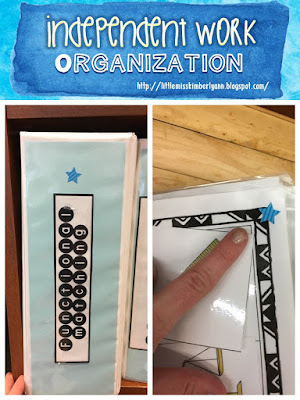 Putting the stickers on each individual piece of work is HUGE because it makes sure that all staff put the correct level of work into the correct binder! Last, I made a little cheat sheet to show everyone in my classroom exactly what work/ tasks each students can complete during independent work. I found the cheat sheet to be very helpful because it eliminates kids getting work at independent work time that isn't really at their independent level. 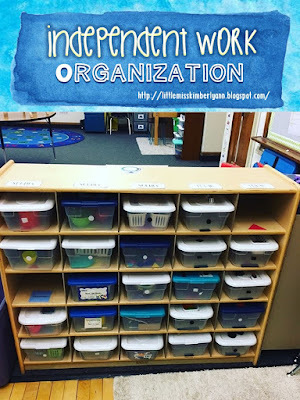 It holds us all accountable for ensuring our kiddos are successful at independent work time! 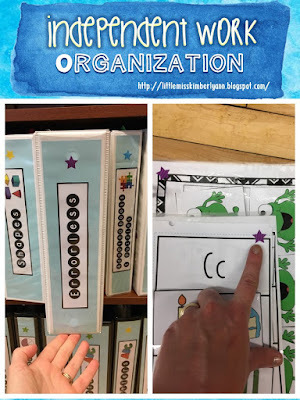 I realize this system won't work for every classroom, but I wanted to share it because it's been awesome for my classroom! We have used this system for about a semester and it's been going very smoothly! 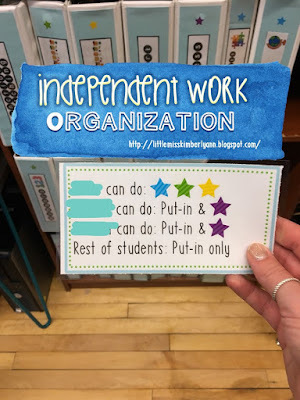 Do you have any tips or tricks for organizing independent work in your classroom? Hi! Love all your ideas about tasks box. Can't wait to implement them in my classroom. 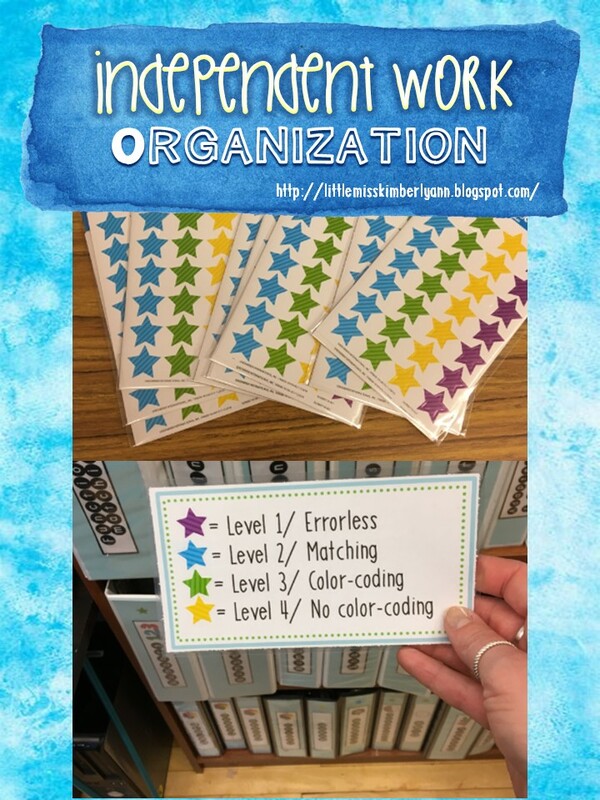 In your leveling, what are some examples of color-coding and no-color coding tasks?